The average college student produces 640 pounds of solid waste each year, including 500 disposable cups and 320 pounds of paper. Thankfully, UT-Austin is a pioneer in not just its sustainability practices (thanks to the Campus Environmental Center and the Office of Sustainability), but through outlets such as the annual campus-wide sustainability symposium (co-sponsored by ESI) and the sustainable design symposium we bring together faculty research, student practice, and public outreach to promote a sustainable world. UT has also compiled information about sustainability-related academic offerings into a single Sustainability Directory. The Directory contains nearly 1,000 records on everything from climate change to green building, and is growing every day. 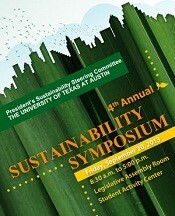 The UT-Austin President’s Sustainability Steering Committee and the UT Office of Sustainability host a full day symposium dedicated to highlighting the scholarly and practical sustainability efforts of the university community. ESI researchers both moderated and presented on panels covering the following topics: (1) Health, Social Equity, and Community; (2) UT-Austin Medical District; (3) Transportation/Mobility; (4) Best of Research and Initiatives; and (5) Waller Creek. 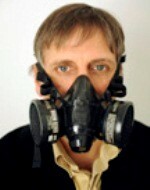 Dr. Richard Corsi, whose expertise include indoor air quality and human exposure to toxins in indoor environments. From the Center for Energy and Environmental Resources to the Center for Sustainable Development, researchers at UT are bringing science to the practice of sustainability. For example, Richard Corsi, Chair of the Department of Civil, Architectural, and Environmental Engineering, has been researching the unintended chemical consequences of going green, the impact of the green products upon indoor air quality, and truly sustainable solutions to environmental challenges. For more about ESI faculty and their research, visit ESI’s affiliated faculty page. The Pecan Street Project panel discussion enlightens the crowd. Sustainability takes many forms, and ESI is dedicated to helping the public, and K-12 students and teachers in particular, understand how to embrace sustainable practices in all aspects of their lives. 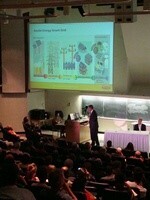 For example, ESI hosted a panel discussion during a Hot Science – Cool Talks event featuring Brewster McCracken (Pecan Street Project), Michael Webber (Center for International Energy & Environmental Policy) and Karl Rabago (Austin Energy) to discuss smartgrid technology and Austin’s Pecan Street Project before hundreds of interested citizens, students, and teachers. For more information, visit Hot Science – Cool Talks. Austin has long led the way in sustainable development, and at UT-Austin the School of Architecture and its Center for Sustainable Design is helping to make sure that UT-Austin is a strong part of that leadership. CSD core interests include: Ecology, Social Equity, Economy, Design, and Policy Making.